Johann Sebastian Bach's well-known French Suites originated toward the end of his Cöthen period (1717-1723), and were revised many times over the ensuing decades. 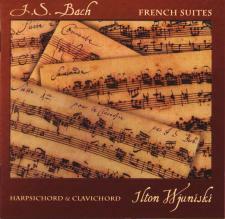 The earliest version -- at least for the first five suites -- has survived in Bach's own hand. It is found at the beginning of a notebook the composer prepared as a gift for his second wife, which bears the title Clavier Büchlein vor Anna Magdalena Bachin [sic]. The notebook was begun in the year 1722, during the first year of their marriage. The suites were entered into the notebook over the course of the next two or three years. With the exception of the first suite, the D minor, BWV 812, which is a fair copy (and therefore must have been composed earlier), the hasty script and the numerous corrections reveal that these were the very first notations of these compositions. The musical quality of the suites reveals that Anna Magdelena was not a beginner at the keyboard at the time of her marriage (in December of 1721 at the age of twenty), but rather a quite competent player. Unlike the case with the Clavier Büchlein which Bach began in 1720 for his nine-year old son, Wilhelm Friedmann, it is apparent that the composer had intended the notebook for Anna Magdelena to serve not so much for his wife's instruction as for her pleasure. Moreover, it seems reasonable to conclude that the presence of the French Suites in Anna Magdelena's album reflects her particular, rather French, musical taste. “While obviously one's touch is not the same on the two instruments, when playing this music on the harpsichord, I try to feel the dynamics and timbral shadings; similarly, when playing on the clavichord, I still try to articulate as 'clearly' as I can.